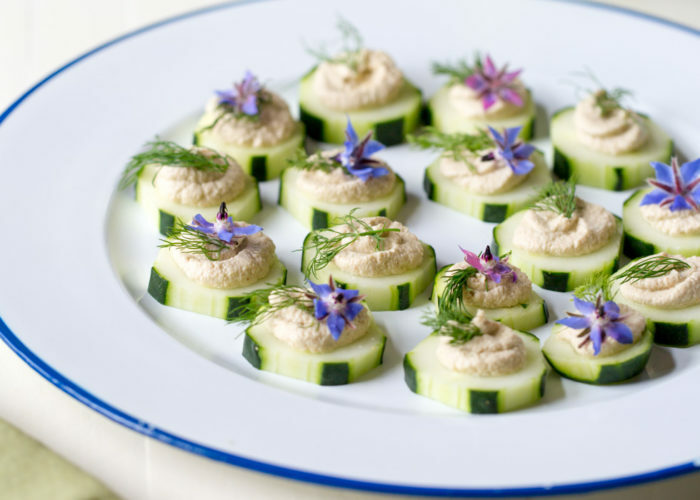 A fresh, healthy, make-ahead appetizer made with a creamy sunflower seed and fresh dill pâté. Garnish how you like depending on the season. I admit that the unit I was least looking forward to in the Plant-Based Professional culinary course that I just finished was the raw gastronomy. The extent of my raw food experience was visiting a raw restaurant in San Diego about 10 years ago. It was delicious, but my dabbling ended there. But you know what? It ended up being a fascinating topic. I love learning new and creative ways to make foods, and the techniques involved in raw gastronomy are really interesting. One of the assignments was to create a raw pâté from soaked nuts or seeds. The sample recipe used almonds, but I had a slew of raw sunflower seeds on hand and decided to give them a whirl. Figuratively and literally. First, you soak the sunflower seeds in water. Then, you blend them up with garlic, lemon, salt … whatever you like. The result is light-colored and smooth (not silky smooth, but smooth enough) – and really addictingly tasty. 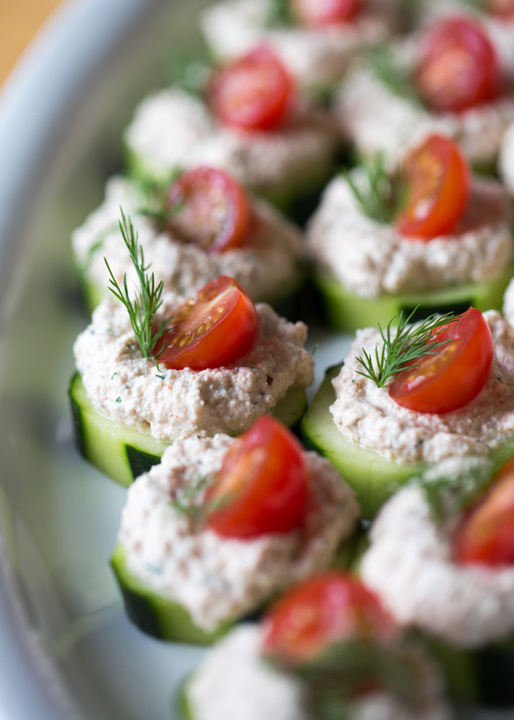 The possibilities are pretty endless, but in this case, I wanted to make a healthy canapé. One of my favorite recipes before becoming vegetarian, many years ago, was a smoked salmon ball. And while I haven’t made that in years, I thought it would be fun to try to recreate some of those flavors in this pâté. So I added dill and smoked paprika and while, of course, not an exact replica, the smoky flavors are perfect with the dill and cucumber. 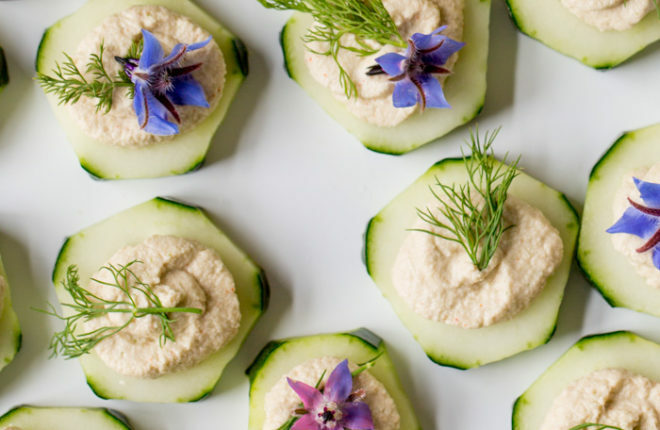 I love this smoky sunflower seed pâté, and I love these appetizers, too! 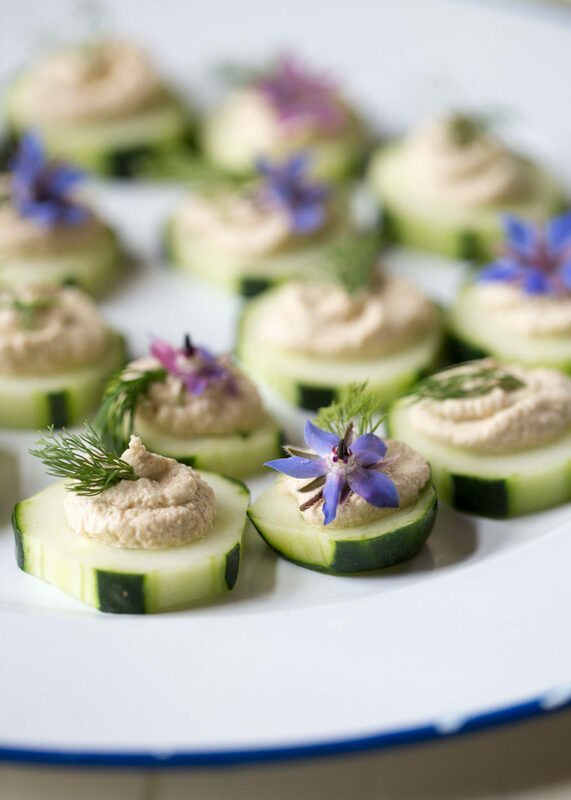 For my plant-based party, I decided to garnish the cucumber slices with borage flowers. I planted borage a few years ago to attract bees to the veggie garden. I knew they were edible (apparently, they taste mildly of cucumber) but never had the guts to actually eat them. Until now. They ended up making a beautiful garnish, though you couldn’t actually taste them at all. 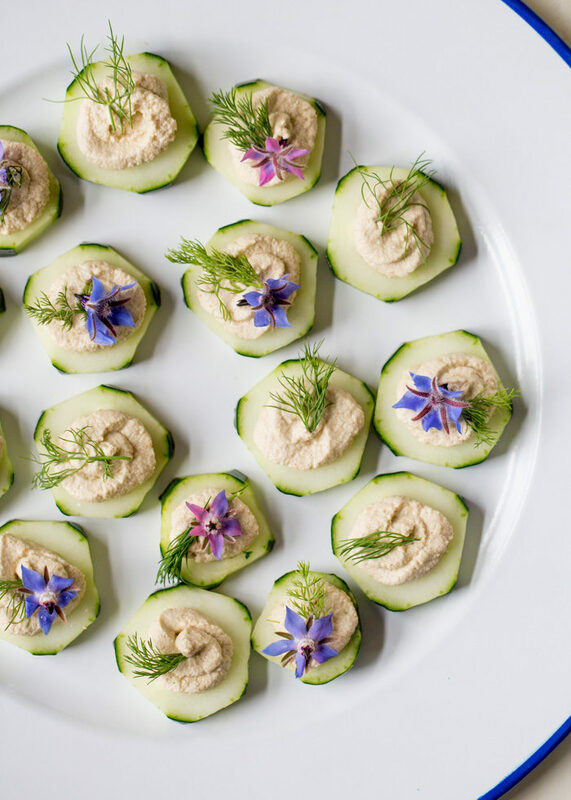 Sunflower seed pâté is officially a part of my life now, and this easy cucumber appetizer is going to be coming out of my kitchen often. It’s so easy to make the pâté ahead of time, squeeze it on, garnish, and serve. Oh, and you could totally swap out the borage for cherry tomato halves and you have the perfect Christmas appetizer! See?! Okay, now please forget that I mentioned Christmas. 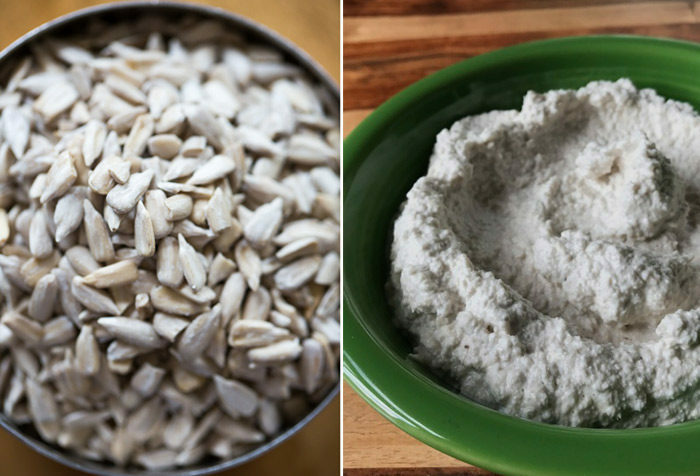 Place sunflower seeds in a medium bowl or jar. Cover with 2 cups of water. Set aside and let soak for at least 4 hours, up to 24 hours. Drain and rinse sunflower seeds. Add seeds to the pitcher of a high-speed blender or (preferred) a food processor fitted with the “S” blade. Add 1/3 cup water, garlic, lemon juice, 1/8 teaspoon smoked paprika, 2 tablespoons dill, and 1/2 teaspoon salt. Puree until smooth, 1-2 minutes. Taste and adjust seasonings if desired. Set cucumber slices on a platter. Spoon pâté into a zipper bag. 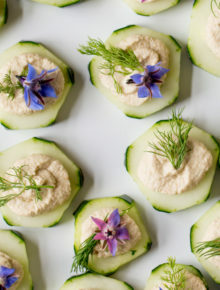 Snip the end off and squeeze pate onto the cucumber slices. For a more professional look, use a pastry bag affixed with your favorite tip. Garnish each slice with fresh dill and borage or cherry tomatoes. Serve immediately. * Time includes soaking time for sunflower seeds. Hands-on time is about 20 minutes. Make sunflower seed pâté up to 3 days ahead of time. Keep refrigerated in an airtight container until ready for use. You can also slice cucumbers and keep them in the fridge up to one day ahead of time (keep them wrapped or in an airtight container so they don’t dry out.